The space satisfies a husband and wife’s differing tastes. Marrying different styles is a lot like marriage itself: It requires balance and compromise. Such was the case with the overhaul of this Wellesley dining room, says interior designer Deborah Berger of Maven Design Group of Boston. “The homeowners each have very different aesthetics. One craved a space that had a New England Ivy League warmth,” says Berger. “The other wanted more of an urban New York City chicness.” Tasked with satisfying both tastes, Berger transformed the large room — which originally had stark white walls that gave it a cavernous, uninteresting feel — into a refined space that beckons for more than just dinner. Refined, old-school elements are paired with those that exude a sophisticated city style: a blend that makes both husband and wife feel at home. 1. Slender drapery panels frame the room’s ample view of a golf course across the street. Light teal Kravet fabric has the look of silk but is really a polyester satin blend; customized nailhead trim adds a little edge, says Berger. 3. A substantial table meant Berger could go big on the chandelier — she chose a crystal one that is 5 feet long. “It’s unusual and fun to use a chandelier of that scale,” she says. 4.Armchairs on each end of the table are upholstered in a Kravet velvet fabric imprinted with a medallion pattern. “It’s a room that isn’t just reserved for dining at night, so I wanted comfortable places to sit during the day,” says Berger. 5. Because the side chairs have a low profile, at least three can fit on each side. “The backs are done in a modern circle way,” Berger says. For durability, the seats are sheathed in a faux leather with chic appeal. 6. The hand-knotted Tibetan rug featuring brown swirls against a stone-colored background belonged to the homeowners. 7. 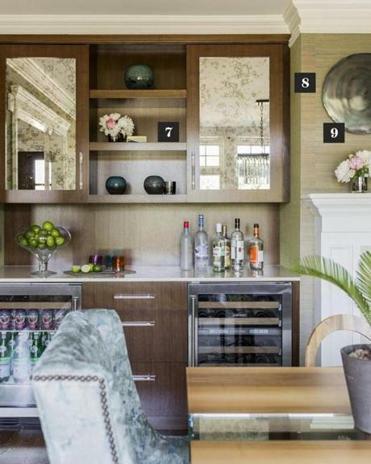 A new walnut built-in has upper cabinets that store glassware and a refrigerator for drinks and wine storage under the counter. Antique-mirror door fronts reflect the verdant views from the windows. 8. To make the vast room feel cozier and more welcoming, Berger selected a warm-hued textural grass-cloth wallcovering by Schumacher. 9. For the wall above the fireplace, Berger hung different-sized disks of oxidized metal. “We went with these nontraditional, sculptural pieces that are a combination of colors,” she says.